VR Zone Shinjuku: Dragon Ball VR Battle! Have you ever wondered what it’s like to fire a kamehameha like Goku? VR Zone Shinjuku wondered and then they created the Dragon Ball VR experience! Fire kamehameha’s until you take out all your opponents (or die trying). 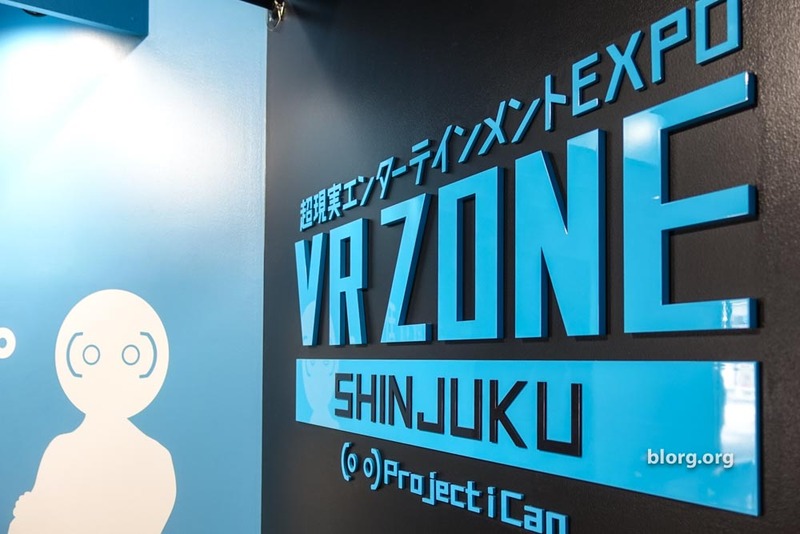 Just to enter the VR Zone Shinjuku facility, you’ll need to shell out 800JPY. They have game sets for sale at a better price, but those tickets sell out and have to be used at specific times. I went with the general admission for 800JPY. Once inside, you’re allowed to buy only ONE ticket for a VR experience at a time. I ended up playing two games; Dragon Ball VR: Master the Kamehameha and Armored Trooper Votoms Battling Dudes (in that order). When I bought the ticket for Dragon Ball, it said the estimated wait time was 50 minutes. While most of the other games had shorter wait times, that was the game I really wanted to play. I purchased a ticket for 1200JPY from the information booth and took a walk around the entire facility. For some reason, I assumed that “wait time” gave me a ticket that I could use to play the game exactly 50 minutes from now. Why else would they only let you buy 1 ticket at a time? That was an incorrect assumption. The estimated time is based on when you get in line for the game. After taking a look around the facility, I lined up for the Dragon Ball game. I wasn’t sure where the line started because I only saw 4 people in line. I lucked out and that was the actual line. While waiting, the host for the game was explaining how to play in Japanese. As I got closer to the front of the line, the host was asking me questions and he happily switched over an English explanation of the game. The game is played as a 4 person free for all. You have three moves that are activated by very specific body gestures: charge ki, kaidan (quick energy blasts) and a kamehameha. We walked through the required moves for the game in both English and Japanese. I’m left handed, and immediately went for a left-handed kamehameha (since I’ve been training to do it that way since I was in elementary school). The host informed me that the game only supports the kamehameha for right-handers so I’d have to switch my movements. Damn. Four characters are available to be your trainer (sensei): Goku, Vegeta, Krillin, and Piccolo. I was given the option to choose first and I picked Vegeta. For some reason, I thought it would be rude to take Goku since I had first pick. The next two people picked Krillin and Piccolo. The last person was left with Goku. Crazy, right!? My adrenaline was pumping when it was my turn. It all seemed futuristic and exciting! I walked up to the “Vegeta” station, stepped onto the platform, took off my shoes and put my belongings in the provided basket. I then put on the VR shoes (they look like slippers with a knob on top). At first, I didn’t understand the purpose of all the technology at the station. There was a large board with a bunch of holes in it and a harness. The worker began putting the harness and VR gear on me. From here on, all instructions were in Japanese. As the worker was checking the harnesses and gear she gave me some instructions in Japanese. I just said “okay.” And then as the game started, there were some instructions about calibration of the sensors which wasn’t too difficult to figure out. Once that was complete, Goku and Vegeta appeared on-screen and started talking (original voices from the anime in Japanese). We started off at the Tenkaichi Budokai arena for charging up and kaidan target practice. When charging up, you could feel the ground shake and wind was blowing up from the ground. Throwing a kaidan has some vibration feedback on the hand sensors. As I looked around in the game, I could see the other 3 players avatars in the game with each of their selected trainers in front of them. In front of me was Vegeta. After that, we were teleported to a rocky landscape so we could practice the kamehameha. You had to get into your stance, pull your hands to the back right in the shape of a ball, charge up, and then throw your hands together forward. As you charged up, the hand controllers would shake more and more and as you shot the kamehameha you could feel this strong gust of wind blowing at you. It felt exactly what I would imagine shooting a kamehameha would feel like from the anime. We got a few practice shots in then the free for all battle started. The VR sets also had microphones so you could speak with the other players. You could hear them yelling “Kamehameha!” and you knew to prepare to throw one back. If you get hit by the blast, your avatar is killed and respawns in the same location after a few seconds. Kamehameha is really the only move to take out an opponent. The kaidan is too inaccurate. I don’t know if there was an ultimate winner of the battle announced since I don’t understand enough Japanese. The game seemed to stop after a certain amount of kills and Vegeta showed up on screen, said a few things and then the game was over. After Dragon Ball, we only had time to play one more game before meeting up our friends for the next event. We asked the person working the sales counter what they recommended with the shortest amount of time. He said, there’s no wait for “High Speed Robot Ba–,” I jumped in and immediately bought a ticket. Eric and I walked up and no one else was in line. There was one game in progress. This looked to be a 1v1, 2v2 or free for all type of battle. They had a paper that listed the controls in English. We tried to memorize it before getting in the seats. The worker gave us these soft paper temporary face masks. Those are used to keep good hygiene between players sharing these VR headsets. I was a little worried why I didn’t get offered one for the previous game. After putting on the headsets the game started. It opened on you being inside a mech in a warehouse. You could look around and then see your mech being pushed upward out of the warehouse onto a battlefield. After 30 seconds of running around at a high speed, I could barely move due to motion sickness. Eric killed my mech in the first round in just a minute. During the second round, I couldn’t move because I thought I was going to vomit. Eric’s mech was running around and came up to my bot for the kill. Somehow he got stuck in front of me so I fired off one missile and that took out his mech. That’s it. Game over. 2 rounds of the game completed in 2 minutes. This game was too fast and wasn’t worth paying for especially since I got motion sickness. The VR Zone Shinjuku facilities were very modern and clean. There’s several bathrooms, lockers and a large food court. There were a few non-VR games like rock climbing and a ball pit slide. I had to go rest in the restaurant area to recover from my motion sickness. The restaurant had tables, chairs and some comfortable benches. It gets pretty loud in the arcade so I’d recommend bringing up decibel lowering ear plugs. Most of the noise comes from the people screaming during the horror game. Overall, the games are pretty expensive considering that you’ll be playing for less than 5 minutes and waiting a long time in line. If you haven’t done REALLY GOOD VR before, it’s definitely worth checking out. Playing the Dragon Ball game was a lot of fun but I don’t think I’d pay that much to play again.